Written by a former Berlin Supreme Court judge who escaped from the Nazis and became a subsequent convert to Quakerism and a lecturer at Woodbrooke, potentially this is an ideal read, written as it was, only five years after the end of the war against Nazi Germany. It is academic, with short, headed chapters and lots of biblical quotations and footnotes. It is meaty; but not an easy book to get into as the early part is dense. It is of its time; written by a state official who fled a murderous state that perpetrated the unimaginable horror of the Holocaust. At one point, it recommends courses of action that some twenty-first century Quakers may find shocking. The supreme example of injustice is Jesus before courts wielding the laws of Israel and of Rome. However, unjust judges do not mean justice is unachievable. Justice is essential and indispensable. Disraeli said [in a speech on 11 February 1851] ‘Justice is truth in action.’ But, in arguing for justice, Konrad Braun does not back away from critics of justice such as T.E. Jessop [Law and Love, 1940] who said that it fails without love. He accepts the point that always seeking after justice, such as in conflicts between unions and employers, allows neither to be generous. Nevertheless, we must recognise the world as it is now, and how different that is to the world as we would see it. For Braun, the world of his time is one of continuous conflict: black against white, anti-Semitism, industrial relations, markets and profit seeking, class antagonism, and the threat of war. He says that for the individual, ‘there is a way of God for every situation’ but recognises that this is ‘an especially hard task in group relationships’ so that in those circumstances, one has to rely on justice. 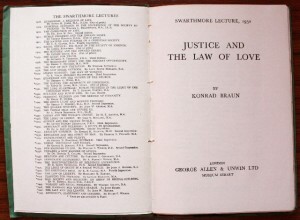 Braun describes the climb to the Kingdom of Love as a process of evolution, from the utter degradation of behaviour as seen in the death camps, through order imposed by authority; then, authority which includes organised justice; then the common weal where the State stands for a just law and a just order, that is, a form of democracy. Following that, there is fellowship where groups cease to insist on their rights but consider the interests of everybody, that is, a society without oppression or exploitation and finally the Kingdom of God that Konrad Braun finds impossible to envisage because it is something that ‘we cannot see or imagine from our limited standpoint in history.’ He takes issue with William Temple [the war-time archbishop of Canterbury] who thought that in trades’ disputes, personal sympathy should not contribute to the determination of the outcome. His view is that consideration of the other person is essential and that arbitration is infinitely preferable to litigation. The problem, as Braun sees it, is the difficulty when full justice has not been achieved. How, in love, should one deal with the moral dilemma of only partial justice? Thus there is the challenge of obedience to the government, ‘especially if government and the law are directed against the principles of true justice.’ This was the issue that confronted the churches in Germany who used Paul’s Epistle to the Romans to justify obedience to the Nazi government. What if the government combines a ruthless dictatorship with a denial of justice? Braun is critical of the Protestant Christians in Germany prior to the rise of Nazism, as, for a long period, they failed in their job of supporting social justice and challenging the rigid social hierarchy. In contrast, what of the Christians who attempted the assassination of Adolf Hitler? Were they right? In such situations, Braun says rules of conduct are impossible. When the state acts wrongly, ‘Christians must openly profess the law of love and peace’ even when they have no special sympathy for the ideas of the oppressed, because ‘it is “that of God in man” that loves and is to be loved.’ We must help those suffering from injustice. We must be prepared to act clandestinely in breaking laws and to lie if necessary. In other words we must set power against power but only non-violently. We must be prepared for suffering and death. Then, what of coercion by the state, both physical and non-physical, as in the case of propaganda? Braun‘s view is that the state needs physical power to enforce law and order but, as he points out, it is not power which generally orders society. Most people regulate their conduct because of tradition and habit, enlightened self-interest, a conscious social obligation, and in some cases religious and moral convictions. Provided it is just, a state it needs to be able to exercise coercion. This means distraint in the case of civil rulings, sanctions under penal law, and action by the police when riots and civil disorder occur. ‘Love need not always be meek and yielding but should be firm and stern.’ Thus does Konrad Braun justify the use of force by the state. ‘For love’s sake, justice must be enforced. But justice is never enough.’ As he said earlier, there must be a redeeming element in relation to state sanctions and we have a duty to ensure that magistrates and judges use love in their employment of justice. Thus capital punishment is totally inconsistent with the exercise of that love. He does not shrink from the difficulty of law enforcement against an individual intent upon violent acts but fails to come down on one side or the other in the case of restraint or the killing of a ‘homicidal maniac’ in defense of an innocent victim. While acknowledging that there are authors such as William Temple and Karl Barth who see no love in the State, Braun supports the idea of a loving State and cites the welfare state as an example of this. Indeed, he goes so far as to suggest ‘that State-life can be lifted up to the level of fellowship‘ although he does admit that this is principally the role of the Church and that, so far, there has been no case of a state rising to this level. However, it is possible for the State to allow for considered opinion in contradiction of its own views and accept a form of conscientious objection. Citizens may well have to suffer, however, in order to achieve this. This, of course, then leads to a consideration of international relations and the so-called just war. First, Braun states that any preparation for defense eventually leads to war. Even a war sanctioned by the Security Council is, by its nature, unjust, as a majority decision is not impartial. Also, war is directed not at the guilty but all citizens of a state. Thus, as the innocent are affected as much as the guilty, ‘a just war cannot exist in the legal sense of the word.’ War also inevitably leads to corruption and as a consequence, all citizens have a duty to support the United Nations which he acknowledges is ‘a precarious system of peace and justice’. In a powerful chapter, Konrad Braun suggests that while non-violence is what is required, it may have no influence upon the aggressor. And yet he suggests that it can be achieved by nations and be effective in opposing injustice but only through religious education because ‘no self-righteous belief in the superiority of any social or economic system can inspire such moral independence.’ There will, of course, in the twenty-first century, be non-theist Quakers who would disagree with this premise. Finally, Braun considers Quakers in this challenge to the application of love and justice. 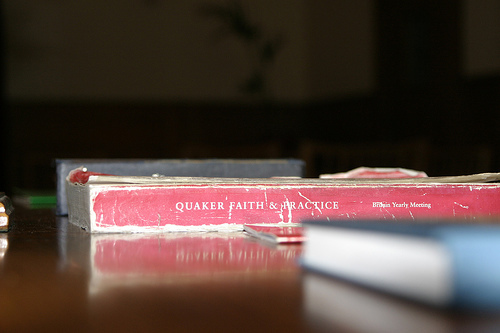 Quakerism is a practical way of living love within the world. He is, however, critical of Friends, saying that the early commitment to changing the social order gave way, as Friends’ prosperity increased, to campaigning on certain limited issues such as anti-slavery and education. He cites John Woolman as the only later Friend to commit to a change to the established order of justice. After briefly covering Quaker states (Rhode Island and Pennsylvania) he considers Friends’ attitudes to a secular state. He uses atypical Friends – John Bright and Joseph Sturge – unintentionally to my mind, to illustrate that relations between Quakers and the State inevitably lead to conflict and resignations. By doing so he suggests that Friends are unable to live easily within the modern state. When he challenges Quaker practice in international relations, his argument becomes less convincing as he fails to explain Friends long involvement in ‘embassies of peace‘. He falls back on Penington and Barclay. The result is that when he returns to the compromises made in the government of Pennsylvania, he sees only a lack of success and withdrawal by Friends. In returning to ‘modern times’ (although now more than sixty years ago), he shows that while not a single Yearly Meeting failed corporately to express its opposition to war, considerable numbers of individual Friends ‘joined the fighting forces’, while others suffered for being conscientious objectors. When one of the former wrote in The Friend in 1943 asking ‘whether justice or peace was to be preferred’, the editor stated ‘rightly’, that this was a false antithesis. Is it? Finally, Braun concludes that people in Great Britain are fortunate, enjoying ‘impartial law courts, an incorrupt administration and tolerable social and economic condition’. We, as Friends, are best placed to work for social, international and racial justice as a ‘constructive and dynamic’ process of peace building. Looking at the world in 2012, I wonder whether his optimism was justified. 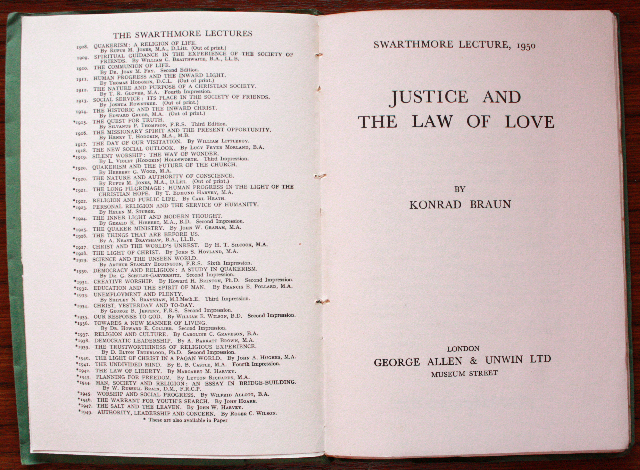 This Swarthmore Lecture is now out of print although second-hand copies are available from http://www.abebooks.co.uk/ or may be borrowed from some local Quaker meeting libraries.